authentic hospitality. Complete with a scratch kitchen highlighting the use of fresh local ingredients along with regional specials and a craft cocktail program rooted in shaking up clever twists on the classics. Use this card to make purchases at any Earls locations in Canada or the United States. The card dollar value will be applied to cardholder’s purchase. 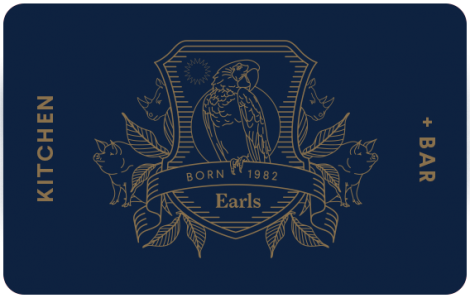 The card balance is redeemable for food, beverages and gratuity only at any Earls Restaurant, and will not be exchanged for cash or applied as payment to a credit card account. Earls is not responsible for unauthorized use of the card, or lost or stolen cards. Issuance and use of this card constitutes acceptance of these terms. Protect the balance on your card – register it today at www.earls.ca.